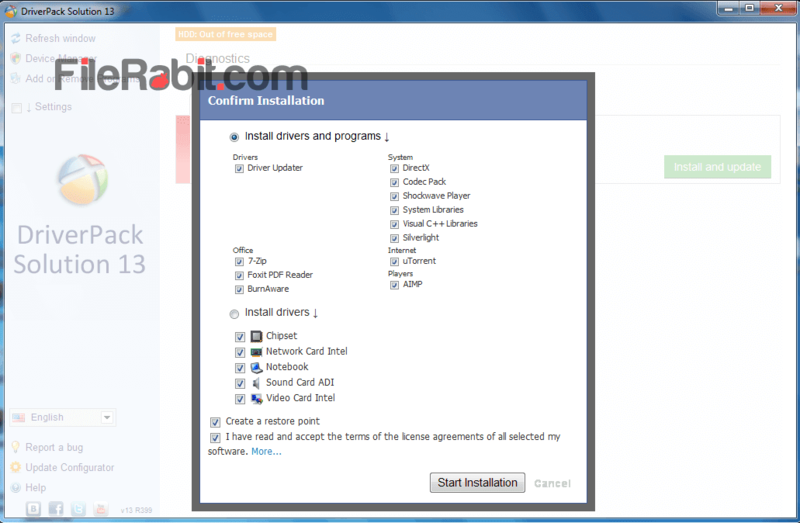 DriverPack solution is smart driver installation tool used to scan computer, find and install missing, update expired or outdated drivers to latest version. DRP is mega pack that includes files for different laptop, notebook and desktop computers. The package is too large in size so it means that it’s rich with Sound/Audio, Video/VGA/Graphics, Network/LAN, WiFi/Wireless, Modem, Printers, Scanners, Fax Machine, Webcam, Bluetooth, TV Card, Joystick, Bar Code Reader and other device drivers. 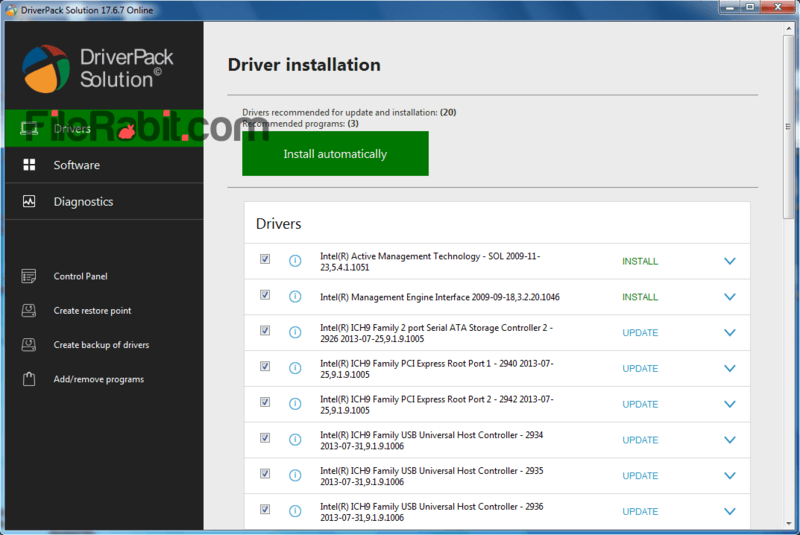 DriverPack solution is a powerful freeware handy application that also offers different software and tools that are necessary for every standard user. It may includes: DirectX, Codec Packs, Avast Antivirus, Foxit PDF Reader, 7-Zip, Shockwave Player, Silverlight, uTorrent and many others. The restore point will help the user to restore if any error occurred due to DRP with going to F8 safemode. Due to wider support of popular manufactures of compute or computer parts, that includes: HP, Intel, Dell, IBM, Microsoft, Nvidea, Acer, Epson, Sony, Samsung, Realtek, Creative, LG, Panasonic, Toshiba, Kingston, Asus, Dany, Apple, Gateway, E-machine, ATI/AMD, S3, VIA, Matrox, 3Com, Conexant, Maxtor, Sharp, Philips and more. The larger pack has more files than light one but its loaded with heavier files. All files pack are compressed with 7-Zip to reduce size on disk. Diagnostics: DRP will do a quick system diagnostics and will show PC information including: Computer manufacture name and model, RAM, hard disk, operating system and antivirus as well. Install Software: Find list of programs and choose your favorite ones from them. The software are related to document reader, multimedia player, Disc Burning, DirectX, Microsoft .NET pack, antivirus, archive and more. Outdated: DRP is eligible to find any outdated or expired drivers that are already installed in your system. After identifying, it shows all of them in list to keep them up to date. Missing: Unidentified or missing files were creating high difficulty for user especially to find exact matching one. DRP has extra intelligent engine that will match product code with its database and automatically show related and supported one. Restore Point: Before installing programs and drivers, DRP will create a restore point that will be usable in case of crashing Windows. The user can run Windows in safe mode and restore system to last created point quickly. 32-bit and 64-bit Support: It has compatibility with both environments of Windows e.g. 32-bit (x86) and 64-bit (x64). So there is no need to download different versions because DRP collect all drivers into single pack.